Luton Town were knocked out of the Checkatrade Trophy after a second round penalty shootout defeat to Southend United last night. Here’s how the Hatters players rated. Marek Stech: 6.5 - Handling looked assured as he comfortably dealt with the little that Southend sent his way. No chance with the equaliser such was the huge deflection it got and came very close to saving some of the Shrimpers penalties but just couldn’t quite keep them out. Frankie Musonda: 7.5 - Looking more and more capable as a right back these days after his switch from central defence. One brilliant cross in the second half should have led to a goal, as he got forward well. Stuck to his defensive tasks impressively with a vital goal-line clearance preventing Southend taking the lead. Jack Senior: 7.5 - Impresses every time he gets an opportunity with his energy and willingness to attack down the left flank. Did the same this time as he overlapped well without neglecting his duties at the back either. Dan Potts: 6.5 - Rash challenge inside the opening few minutes led to a booking which meant he had to be careful. Played centre half for the first time since Swindon away in this competition two years ago and relatively untroubled until his attempted block sent the ball spinning past Stech for a late leveller. Lloyd Jones: 6.5 - Another who needed the run out after seeing his first team chances limited in recent weeks. Kept things tight before getting lucky with his penalty as given another go after his initial attempt before the whistle was saved. Alan Sheehan: 7.5 - Played in the holding role this time and got a valuable 90 minutes under his belt. Read the game well, often in the right place to step in and win the ball back for his team. Set-pieces, as usual, caused plenty of danger all evening, one leading to Town’s goal. Arthur Read (STAR MAN): 7.5 - Midfielder began in exciting fashion, with a glorious pass through to Hylton and with his confidence-boosted, tried to stamp his authority on proceedings. 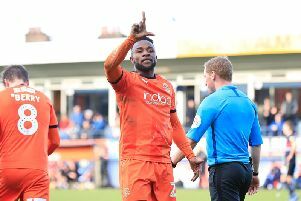 Cracking hit for his first ever Hatters goal and although had to go off with cramp soon after, will always have fond memories of the night despite Luton going out. Jorge Grant: 7 - Eager to get on the ball and start Luton off from deep with passes out to the flanks, while he got into some good positions to have a few attempts at goal which he dragged wide. Kazenga LuaLua: 7.5 - Grew into the game as during the second half, really started to show his ability and threat, picking up the ball and driving at his markers. Always looking for that yard of space to unleash a shot, with one fierce drive blocked and another forcing a fine save from Oxley. Danny Hylton: 6.5 - Another who will benefit hugely from the 90 minutes as he looks to get back to full fitness after a recent spell out. Few things just wouldn’t quite come off as he headed against the bar from close range. Decent enough penalty in the shootout, only to see Oxley save well. Aaron Jarvis: 6.5 - Like Hylton was well marshalled by an experienced back-line as he continues to learn on the job. Put one chance wide when he should have headed back across goal, while he saw his spotkick repelled. Pelly-Ruddock Mpanzu (SUB): 6.5 - On as Read went down with cramp for the closing stages. James Justin (SUB): 6 - Had the final moments in place of Senior.